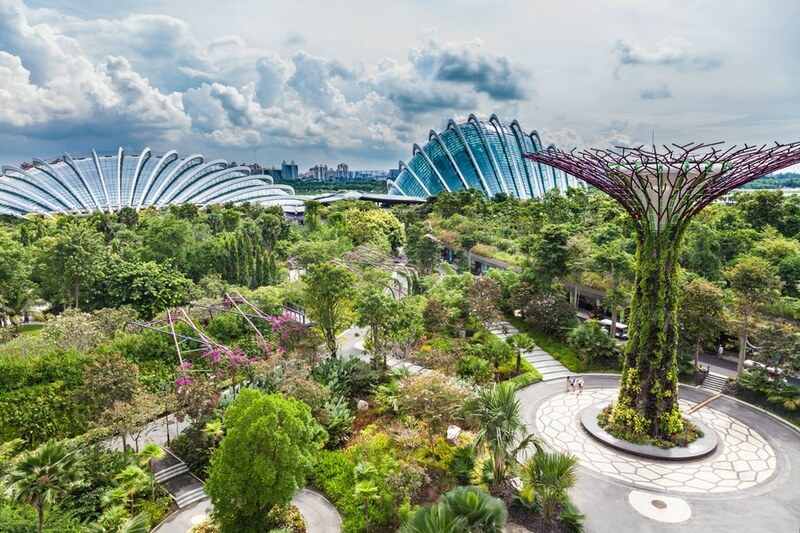 There are places on this Earth where you simply stand, slack-jawed, and pinch yourself to make sure you're not dreaming – and Singapore's Gardens by the Bay said to be one. 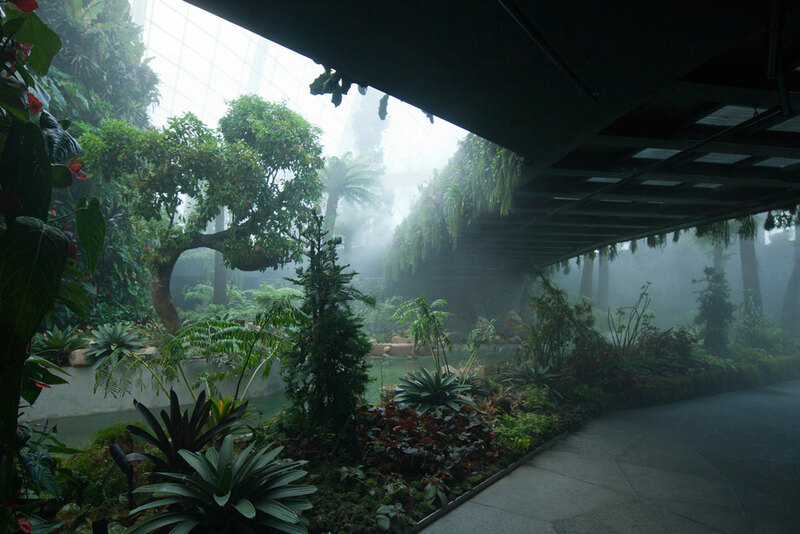 This billion-dollar techno-garden theme park is absolutely stunning right through, but the two stand-out highlights are its signature Supertree Grove – a collection of giant cyborg trees……..
……and the Cloud Forest – a gigantic bio-dome that recreates the environment and climate of a mountaintop forest at sea level. 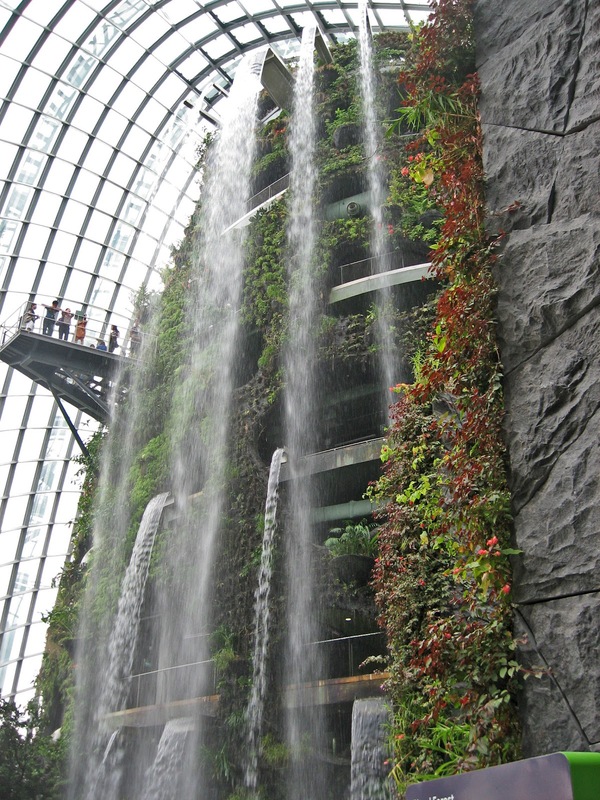 As a bonus, there's also the world's tallest indoor waterfall. 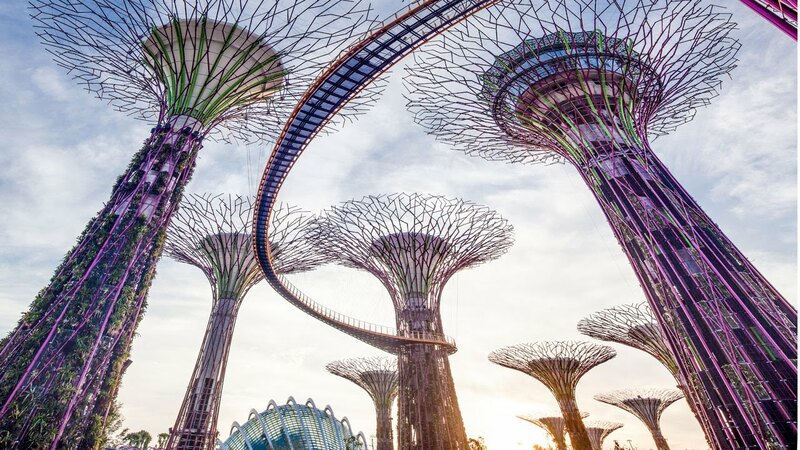 Standing between 80-160 ft tall, each Supertree is a vertical garden supporting a range of ferns, vines, orchids and other plants, which creep over the towering, purple skeletal structures. 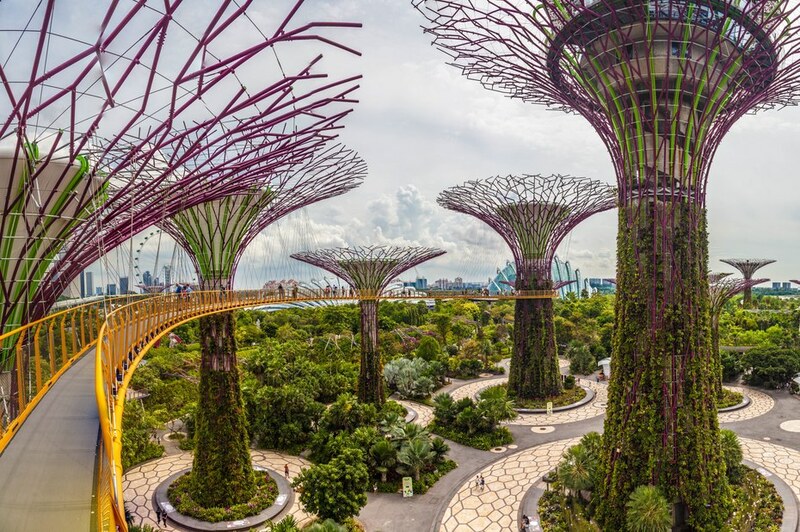 Each Supertree is designed to mimic the function of a real tree, with photovoltaic cells to echo photosynthesis and contribute energy to run the park. 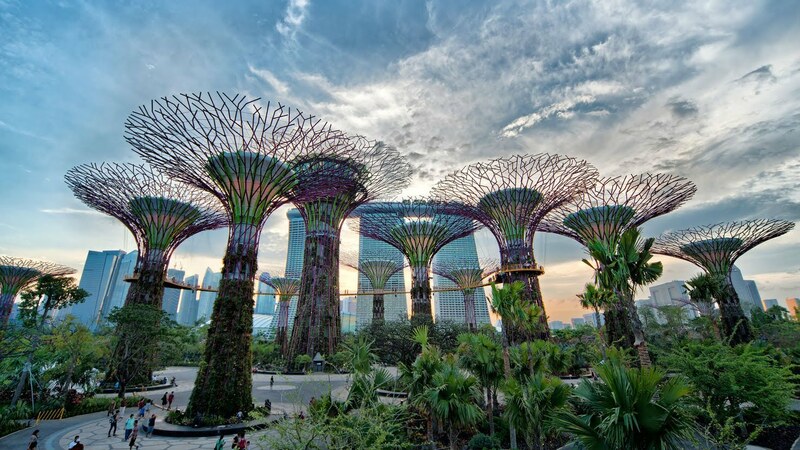 The trees also collect water during Singapore's frequent heavy rains and channel it throughout the park wherever irrigation or fountains are needed. 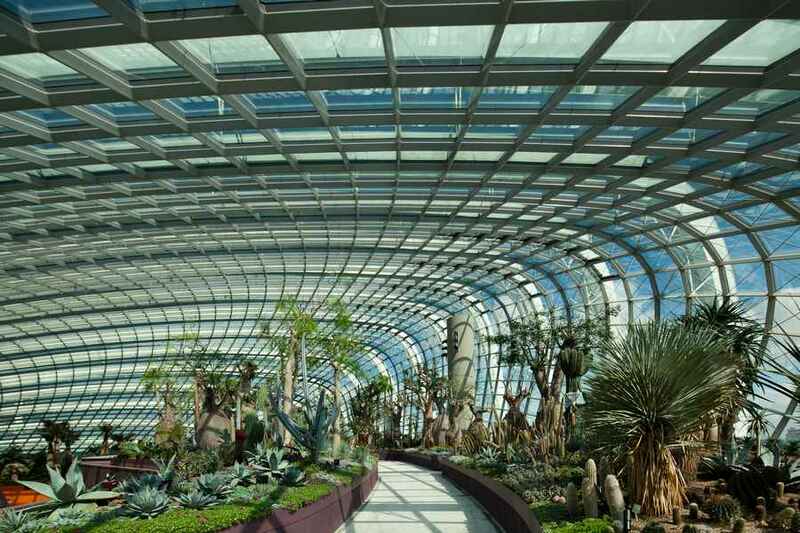 A short walk from the Supertrees, you can find a pair of climate-controlled bio-domes. 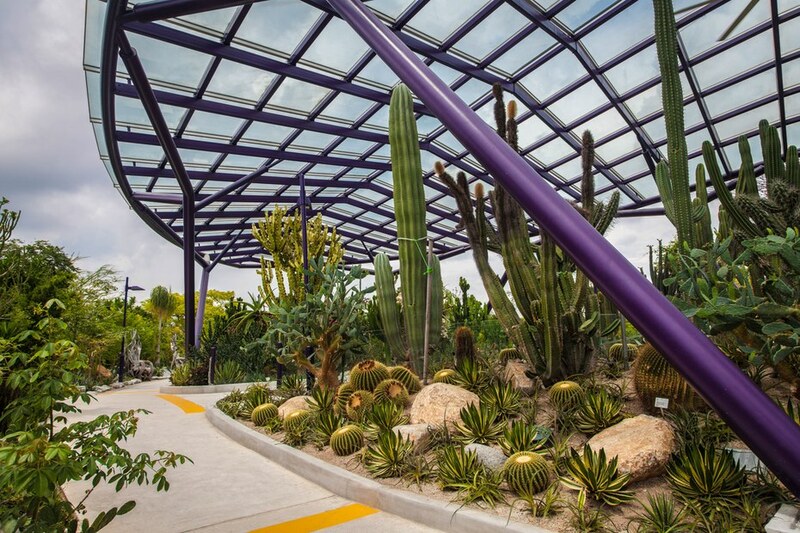 The Bio-Domes feature a range of plants from Mediterranean, Australian, South American and South African regions. 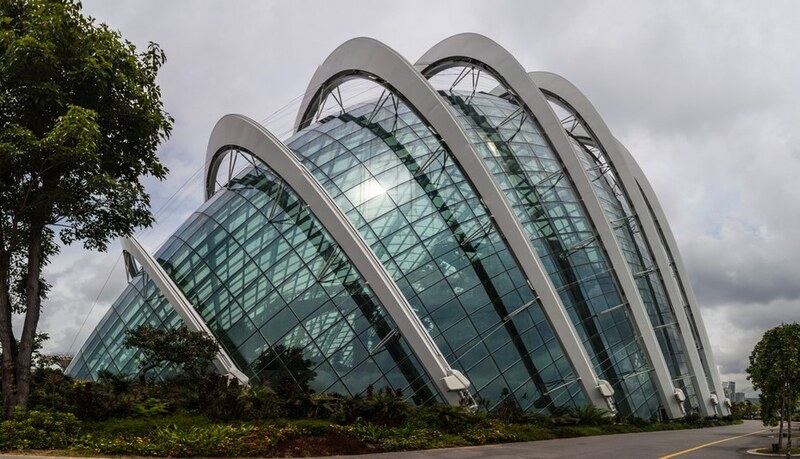 The Cloud Forest is a man-made mountain inside a climate-controlled dome that replicates the cool, moist conditions on top of tropical mountains between 3,300 to 9,800ft above sea level. 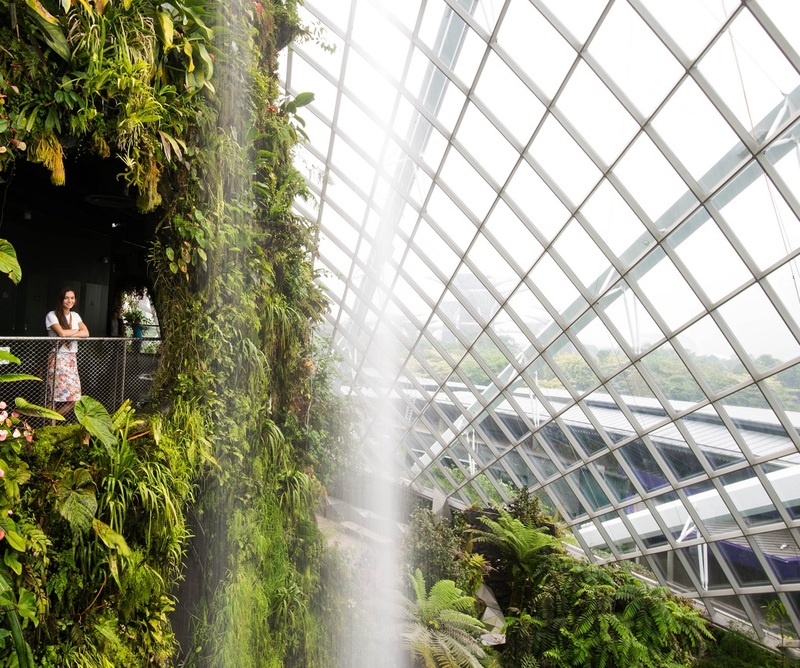 At the entrance you're greeted by a refreshing blast of cool air, followed by the sight of the world's tallest indoor waterfall, which rains down water and mist from 115 ft above the floor. 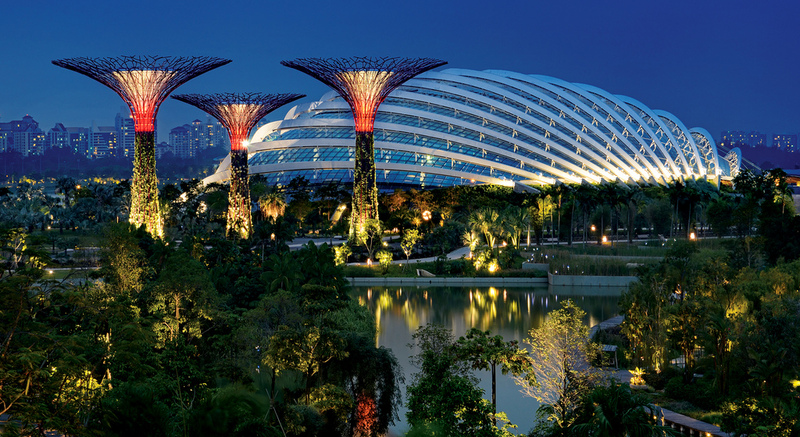 Underlying the concept of Gardens by the Bay are the principles of environmental sustainability. 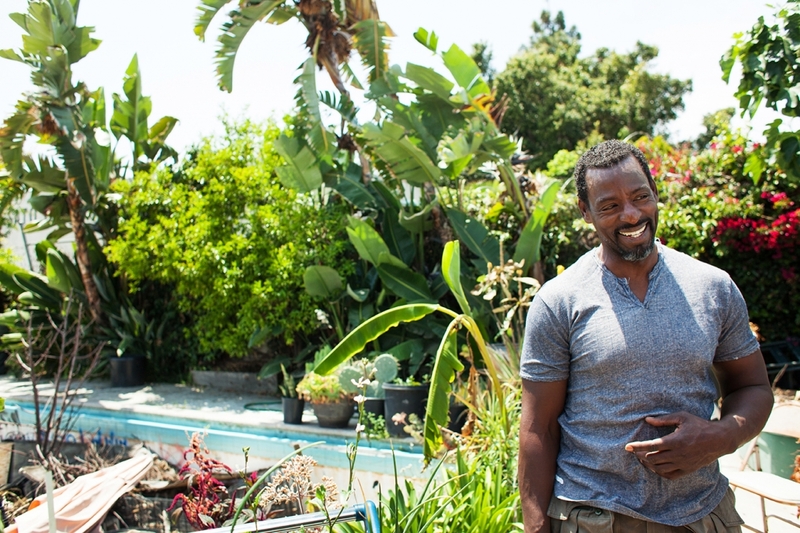 Much effort was made to plan and design for sustainable cycles in energy and water throughout Bay South Garden. "Sustainable Gardening, Eating, Living…..and all that jazz" Copyright Disclaimer: Right to use photos claimed under: Section 107 of the Copyright Act 1976, allowance is made for fair use for purposes such as criticism, comment, news reporting, teaching, scholarship, and research. Fair use is a use permitted by copyright statute that might otherwise be infringing. Non-profit, educational or personal use tips the balance in favor of fair use. The future in NOW! It is so heartening to see that there are people with the scope of vision to produce something this spectacular, demonstrating the power of Nature coupled with the ingenuity of man. 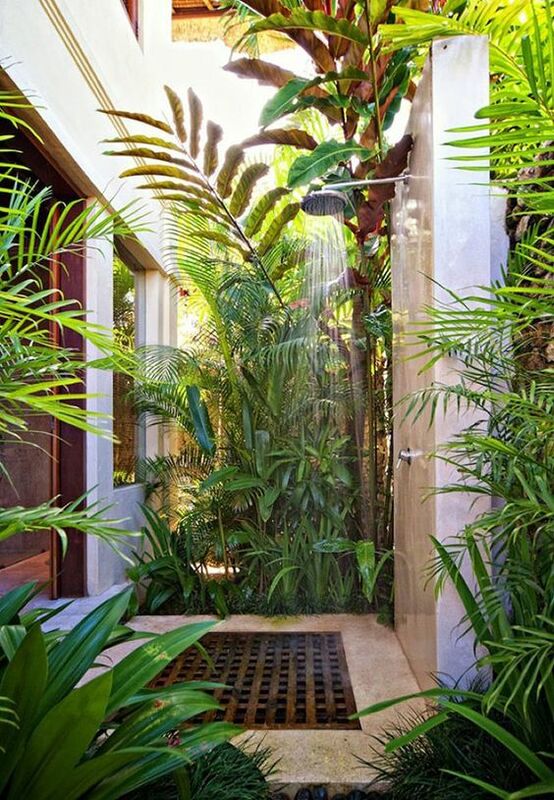 Perhaps someday soon there will be places similar to this sprinkled all over the earth. Thanks for getting the word out, Doug. It's a drop of water in the pool, but the ripple-effect is unphathomable. Well said, it’s a drop in the pool yes, but it seems the mindset may soon become a necessity of thinking of creative ways to preserve the ecosystems of the earth.